It's admission time, people. I have to confess. 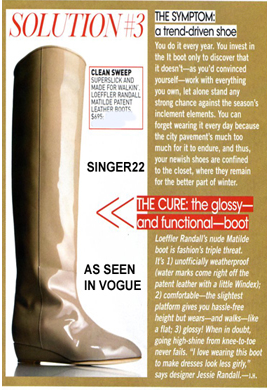 As you may know, I've been a longtime obsessive fan of Sigerson Morrison shoes. My love affair continues. Kind of. I love them still. Just lately, I'm not quite in love. You know the difference, right? Maybe I just need to take a vacation alone with my Sigerson Morrison flats and heels to revitalize the romance, bring back the spark. Or maybe I need to take a break from them for breathing room. Maybe we just need couples counseling. Anyway, now it seems like I'm consumed wholly with Loeffler Randall. 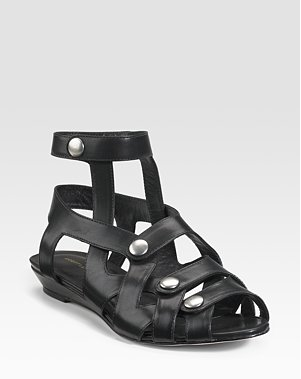 And now I bought the above sandals at Milk on Third Street, where they're having their big seasonal sale. These mofos look even better on. Seriously. I'm thinking this Loeffler Randall thing is more than a crush. This could be a long term relationship or at least summer loving. (It happens so fast.) Go Grease, right M? Either way, it's not just new and exciting. This one's gonna last. Not to get all cultural on your asses, but, for the Jewish New Year, one generally eats apples and honey to represent the sweetness of the coming year. 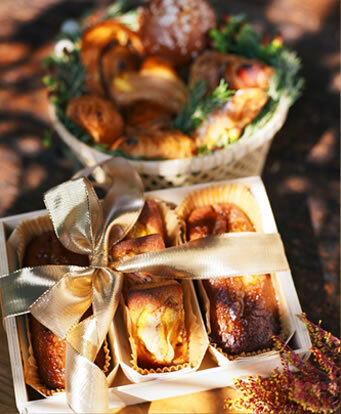 Of course, I like this tradition because, well, it involves food. But I also like the simple symbolism of the thing. Since the more widely accepted New Year just passed (Widely accepted? Christian? American? Western Civilization's? I have no idea what to call it, but you catch my drift), I thought it would be nice to start off with this slightly tastier interpretation of apples and honey. 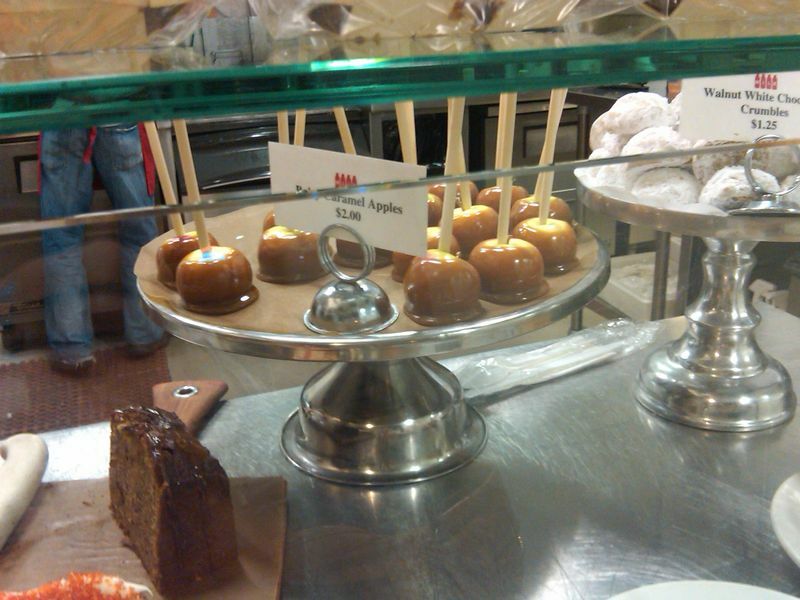 Namely, at Milk on Beverly, the caramel crab apples, which are just as adorable as they are a brilliant culinary invention! They're all autumnal too. See? And people say LA has no seasons. Why? Just because it's like 80 degrees and sunny in January? It gets downright (a little) chilly at night. Really it does. I have to wear a cotton sweater with my flip-flops. P.S. In the interest of full disclosure, I should admit that I DID also have to lodge a complaint while at Milk: They actually discontinued my favorite strawberry sorbet and Parisian macaroon ice cream sandwiches (called "Lady Bugs," I think). I filled that comment card right up. Yup. I'm THAT girl. 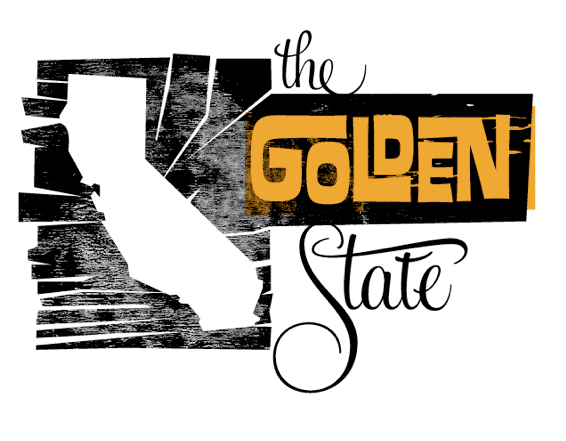 Make new friends, but keep the old, one is silver and the other is Golden State. Actually, the new friend is Golden State, as B + S reports that the resto will finally be opening it's Fairfax doors on March 12th. The website is up and she even snagged an early menu draft (though it seems to be down off G.S. 's site right now–oopsy–too early?). The spot will specialize in (what else?) Cali's best offerings, especially in the sausage department from spicy lamb to English banger. I just think ordering "English banger" sounds fun and dirty. Cabbage and Jalapeno Slaw sounds pretty tasty. And I believe there will be a local wine and beer component too. Golden State is another addition to the deeply traif restaurants that keep popping up on largely hassidic Fairfax and in the Beverly vicinity. First there was Milk and then Animal (never together OF COURSE) and now this. (If you're curious, you can read my LA Confidential article on Animal). Anyway, not sure how the hassidic peeps feel, but it sounds pretty damn Golden to me! In LA this season, a V.I.P. 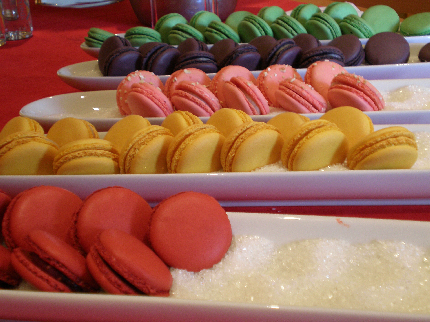 event without Voss Water and Parisian "macarons" is like, well, a V.I.P. event last season without cupcakes and champagne (which I still insist is a sickeningly sweet combination BTW, as I blogged back-in-the-day for Variety's The Stylephile). Anyway, point is, those colorful little almond-infused sweets are a must (even though the occasional lavender one borders on soapy). 1. BOULE: I've already blogged about Boule's life-changing fleur de sel eclairs, which–in the first weeks after I discovered them–I would go buy under the pretense of "sharing them with friends" and then promptly eat them all myself. Well, Boule makes pretty extraordinary macaroons too. 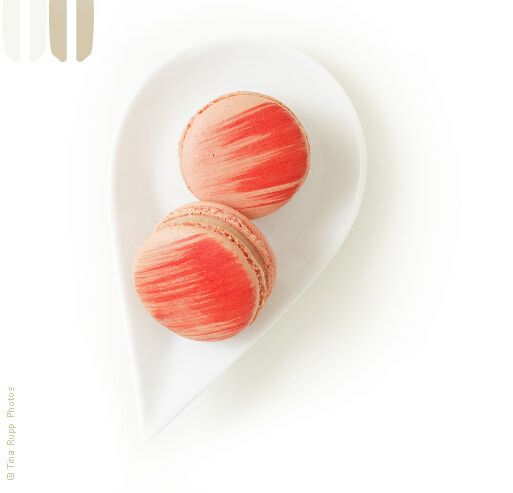 And, at their new La Cienega atelier, you can actually watch them create confections, while you nibble away at flavors like Rose Water, Pistachio and, yes, Sea Salt Caramel. YUM. 2. LITTLE NEXT DOOR: This chic, pretty spot (the adjoining cafe to top LA eatery Little Door) is a lovely place to sit. And, actually, the pastry chef was, at one point, the pastry chef at Boule, so . . . there you go. With little art nouveau-style tables, a wine wall and authentically French waiters (or at least gifted LA actors), Little Next Door is a bit like being transported to Paris. 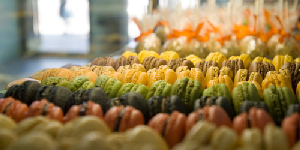 And, when in Paris, eat Parisian macaroons! Mais oui. 3. LA PROVENCE: One of those surprising LA mini-mall finds, La Provence Patisserie & Cafe has an old school family owned business vibe: warm and festive with feminine pastel-touched decor. You just know that these macaroons were created with love, using someone's great grandmother's secret recipe (maybe not, but let me imagine). Buttercream-filled flavors include Lemon with fresh squeezed curd and Coffee with espresso reduction. 4. PAULETTE BEVERLY HILLS (pictured above): Paulette is known for the beautiful packaging that accompanies her "macarons." And, thanks to this week's event, I can vouch for the vibrant colors, pretty sugar-filled dishes and, well, the slightly tart deliciousness of the Raspberry flavor. Also, Paulette is dedicated almost entirely to macaroons, so that's certainly a vote of confidence. 5. MILK: Okay, so at Milk, they do something a little bit different and I am OBSESSED: Parisian Macaroon Ice Cream Sandwiches. Yup. For reals. And, for lactards like moi, there's even a Strawberry Sorbet one, which might sound super sweet, but it's actually tart. If I wasn't milk-challenged, though, I would surely go for the Grasshopper with mint ice cream and a mint Parisian macaroon dipped in chocolate. 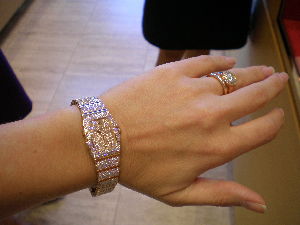 Like my rose gold and diamond watch? It's just a little out of my price range, but it sure looks sparkly with my engagement ring:) Maybe for our first anniversary. Whaddya say, Andrew? 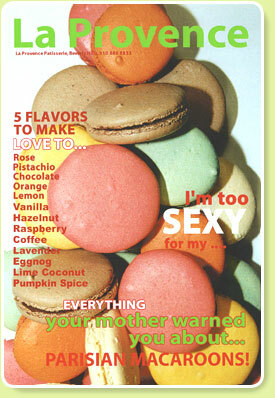 ***I'm mostly going with the "macaroons" spelling, instead of "macarons," unless the above spots do otherwise. I mean, I don't want to be one of those people who says "Buda PESHT" or suddenly rolls their "r"s dramatically when the word "burrito" comes up in a sentence, you know? Just saying.